Last weekend, we visited Crealy Adventure Park near Exeter for the second time in a week, thanks to their very generous free returns in six days scheme. One of the benefits of living in Devon is being able to visit attractions when they're a bit quieter. So on the previous weekend, we'd taken full advantage of the unseasonal sunshine and had pretty much free reign to ride the most popular attractions several times with little or no queueing. 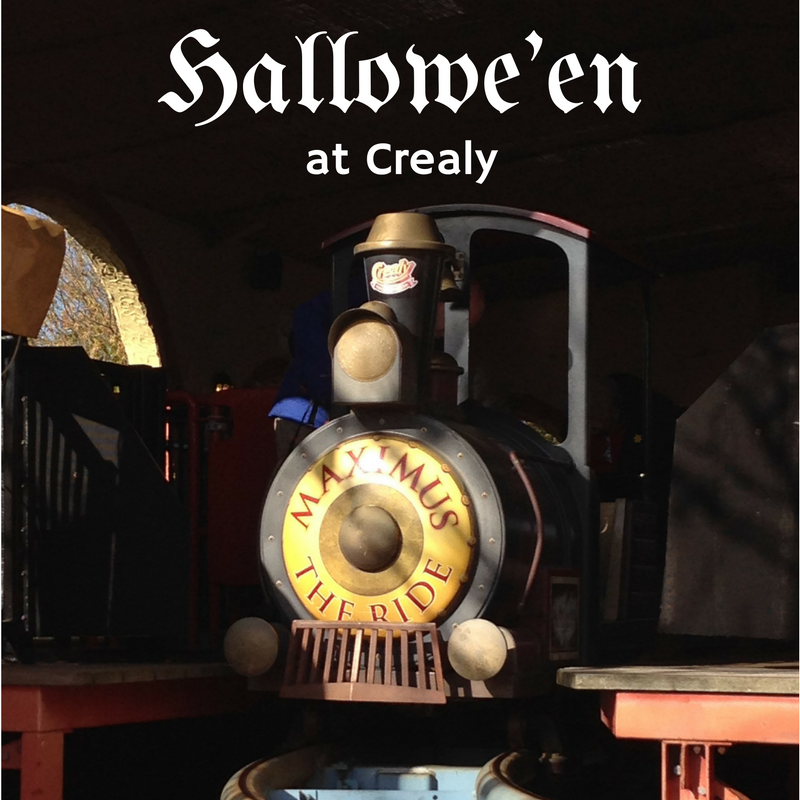 We expected the park to be a bit busier this weekend as it was the start of Crealy's half-term Hallowe'en extravaganza. So, as well as the usual attractions, there were added extras, such as Creaky House, Trolls in the wood and pumpkin carving. When we arrived, again we benefitted from amazing weather, the park was still quiet and we headed straight to our favourite rides, starting with the wetter ones so we had time to get dry before it was time to go home. The aqua blaster boats are probably the wettest ride and after soaking each other, we teamed up to squirt everybody else on the lake. I shared a boat with Beatrix, who took on the steering responsibilities, while Wilf shared with his dad and Elliot was big enough to captain his own vessel. We then headed down to the Tidal Wave log flume. I had been on this with Wilf the previous week and managed to avoid riding again by opting to look after a sleeping Ossie in his buggy. Despite it being half-term, the park was still fairly quiet and they managed to stay on the ride for a few times as there was no queue. As well as the Aqua Blasters and the Tidal Wave, Crealy has the Vortex triple water slide, which we'd been on the previous weekend. We decided to take advantage of the lack of queues and headed straight over to the Maximus roller coaster. Elliot and Beatrix were incredibly excited to get a spot at the front of the train, while 4 year old Wilf rode further back with his dad. After this, Wilf wanted to go on the Dino Jeeps again before we began investigating the special Hallowe'en attractions. So, we headed for the Creaky House, only to be told it was closed for lunch, so instead we returned to the Carousel, Honey Swing and Flying Machine swings before wandering down to find the Trick or Treat Trolls. These are based across a rickety bridge in a forested area of the park we had never visited before. We enjoyed a lovely stroll through the trees and the children were rewarded for finding the trolls with lollipops. 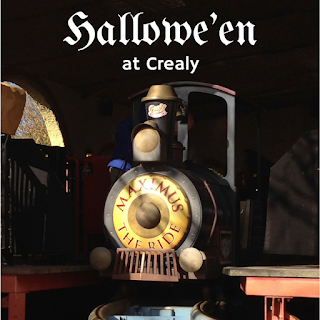 Once we returned to the main park area, we decided to try the Creaky House again. Unfortunately, it seemed that everyone else at Crealy had the same idea and we found ourselves in our first queue of the day. After an hour of waiting, we were guided through the haunted hotel and encountered lots of spooky occurrences before landing back in the reality of the park. Because the queue was long, Mr SeasideBelle opted to take baby Ossie up to the indoor Atlantis play area, where they had great fun in the soft play. It was a good option because the queue was something of a time warp and by the time we emerged, the park was almost ready to close! So we scooted up to the animal barn, where we had held the rabbits the previous week, to pick up a pumpkin. You can actually carve them there, but we were too late for that. If you take advantage of the free returns, the park is great value for money and you can definitely spend two full days there without worrying that the kids are spending too long in the play areas. The indoor play areas are also a great option to get out of any inclement weather. I looked at getting a season ticket, but I think I'll probably wait until Ossie is old enough to participate a bit more. While my older two are the perfect age for Crealy and Wilf, who is 4, is now tall enough to be able to go on most of the rides, I still need to have an adult with me, to look after baby Ossie. So that would mean we would only be able to go when both Mr SeasideBelle and I have a day off, which is not as often as I would like. However, after picking up a leaflet promoting their campsite and hearing great stuff about the underfloor heating in the shower blocks, I think we might be taking a trip over with our tent next year! What's your favourite theme park and why?